My title for that post was "Not sure I believe this": It seemed like an awfully large change, and I wondered if it reflected the context of the questions in the surveys--that is, the questions in 2015 and 2016 might have appeared after questions that got people thinking about discrimination. The 2015 questionnaire is available, but I haven't checked, or if I did I've forgotten. A substantial move towards seeing worse treatment. I noted that the 2018 sample was different from the earlier ones, though. A big change between 2013 and 2015--note that the percent of "don't knows" was quite a bit lower in 2015 than it had been. The ones marked with an asterisk asked about "blacks," which could make a difference. You could reasonably raise doubts about any of these results, but the overall pattern is clear: there was a substantial change in opinions between 2014 and 2015. In fact, you could be more precise and say the middle of 2015. The shooting of Michael Brown occurred in August 2014, and lead to protests which got a lot of media coverage. There was no video in that case, and people had different interpretations. On Nov 26, 2014, a surveillance video of the shooting of Tamir Rice was released, which also got a lot of media coverage and was widely shared on social media. Since then, there have been many other videos of police shootings. More recently there have been videos of black people doing ordinary things and being confronted or having the police called on them. I think that these have made a difference--most news stories, even ones that get a lot of media coverage, don't change many opinions because they are complicated and can be interpreted in many different ways. But a video of an everyday situation leaves less room for interpretation (although there is always some) and there was not just one, but a series of them. 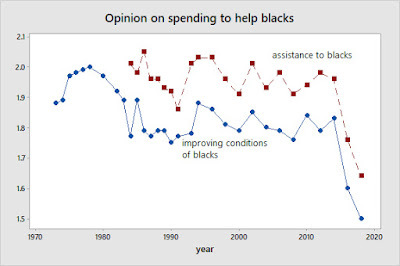 In conclusion, I think that there is strong evidence that opinions have changed: people see more discrimination against blacks than they did just a few years ago. That raises a few other questions, which I will discuss in my next post. So opinions on both apparently made a big move in a "liberal" direction between 2014 and 2018. The change from 2016 to 2018 might be partly the result of the change in administration: responses to questions like this tend to move left with a Republican president and right with a Democrat. But of course that doesn't explain the 2014-6 changes, which are very large. Could it just be some kind of mistake? Again, there's a large move in a liberal direction on both opinions between 2014 and 2016, and a smaller move in a liberal direction between 2016 and 2018. On all questions, opinions in 2018 are more liberal than in any previous year. Until 2014, Democrats and Republicans had been moving in different directions, but between 2014 and 2018 they both moved towards the "special obligation" end. That doesn't fit the idea that the change was a Democratic reaction against Trump. So what caused the change? I'll address that in my next post. PS: Steve Morgan made some similar points on Twitter. to help improve their living standards; they are at point 1. The woman wants it for any reason. 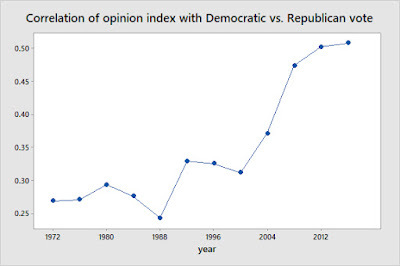 I computed the correlation of opinions on each with vote for the Democratic or Republican candidate (third party voters were excluded) in elections from 1972 to 2016. 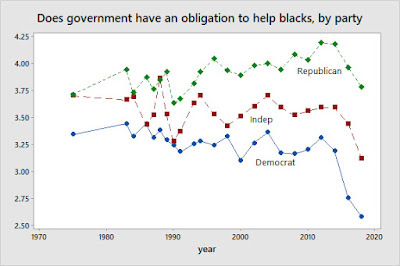 The correlations for equalization, helping blacks, and helping with medical bills track each other very closely--that wasn't why I picked them, it just turned out that way. 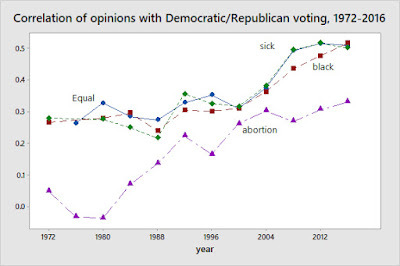 In the 1970s, opinions on abortion had almost no correlation with vote, but then it started to catch up and it's now comparable to the others. There's an upward trend for all of them--that is, supporters of the Democratic and Republican candidates are more distinct. People have known about the increasing association between opinion and party for long time, but some new things emerge from a closer look. First, there is a difference between the trends for abortion and the other issues. It's close to a linear trend for abortion, but not for the others. I took an average of the correlations for the other three items and plotted it against time. There's clearly a more rapid increase in the 21st century. It's hard to date it exactly, but there was a large increase between the 2000 and 2004 elections, and another one between the 2004 and 2008 elections. 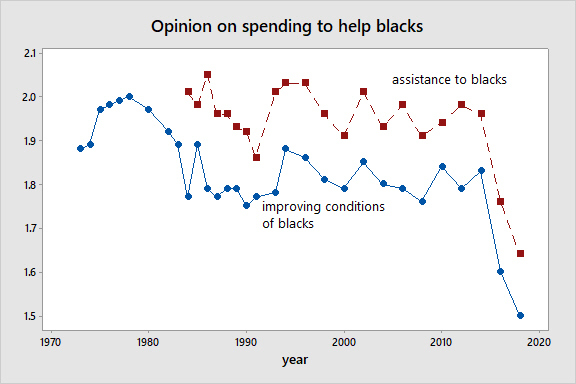 In 2016, the correlations for general equality and helping with medical costs declined slightly, and the correlation with helping blacks rose. Those changes fit with common accounts of Trump's appeal, but they were not very large. Second, there has not been a shift from emphasis on "economic" issues (the first two) to "social" issues (abortion and arguably race), which people often say has happened. 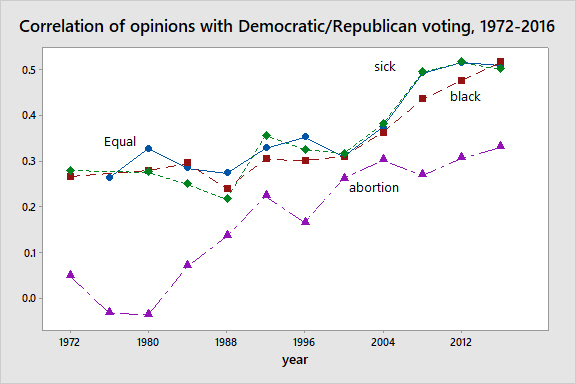 "Economic" issues are less important in a relative sense because some new social issues have emerged (just abortion here, but I would guess that some others have followed a similar course), but more important in an absolute sense--that is, vote can be predicted more accurately from economic opinions than it could back in the 1970s. Third, there has not been much variation between individual elections, suggesting that specific characteristics of the candidates or campaigns have not have much impact. PS: The correlations for 1996 and especially 1992 are probably exaggerated because of votes for Ross Perot. I expect that Perot voters were mostly in the middle ideologically, making the separation between Democratic and Republican voters bigger. I don't think that John Anderson had much impact in 1980--the opinions of his voters were probably close to those of Carter's. "As you may know, presidents are chosen not by direct popular vote, but by the electoral college system in which each state receives electoral votes based on its population. Over the past one hundred years, the winning presidential candidate has won both the popular and electoral vote. Let us suppose in this election that one candidate were to win the popular vote and one candidate were to win the electoral vote. Who would you favor serving as the next president of the United States--the one who wins the popular vote, or the one who wins the electoral vote?" 57% said the candidate who won the popular vote, 33% the candidate who wins the electoral vote, with 10% not sure. Note that this question didn't ask about changing the system in the future--it asked about who should be president after the 2000 election. It also pointed out that we currently did it by electoral vote, not by popular vote. Nevertheless, a clear majority said that the president should be the one who won the popular vote. The implication is that every time there is a discrepancy, there is a risk of conflict--if leading supporters of the losing candidate don't accept the result, there is a lot of popular sentiment that they can appeal to. In 2000 and 2016, leading Democrats accepted the outcome--there were only a few complaints, and no effort to mobilize against it. But can we count on that happening again if there's a discrepancy in 2020? I wouldn't bet on it. People could say that the Electoral College results are tainted by voter fraud or voter suppression in a few key states. Of course, that wouldn't prevent a president from taking power, but it would make the losers feel justified in engaging in more extreme tactics, which would make the winners feel justified in engaging more extreme tactics themselves. In November 2018, I had a post about the difference between elite and popular ideologies. Politicians can be classified as simply liberal, moderate, or conservative, but in the general public opinions on economic and social issues are almost uncorrelated. As a result, there are substantial numbers of people who are liberal on economics and conservative on social issues or conservative on economics and liberal on social issues. So why don't any ambitious politicians try to appeal to those combinations? In February, Paul Krugman had a column on the same issue, which even had a similar title. I have a couple of disagreements with his analysis: (1) he claims that there are very few people with the economic conservative/socially liberal combination and (2) he says social conservatism can be reduced to racism. But he also linked to a paper by Brian Feinstein and Eric Schickler that offered some interesting historical evidence. 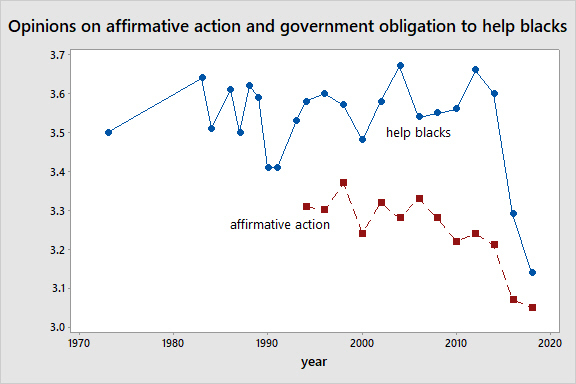 Their idea was that even though Franklin Roosevelt stayed away from issues of race, the New Deal ideology (government should help the disadvantaged) naturally led to support for civil rights and the ideology of opposition to the New Deal (defending states' rights and individual property rights against an overbearing federal government) naturally led to modern racial conservatism. They showed that state party programs gradually diverged on civil rights issues, and in the North the Democrats were considerably more liberal than the Republicans by the 1950s. 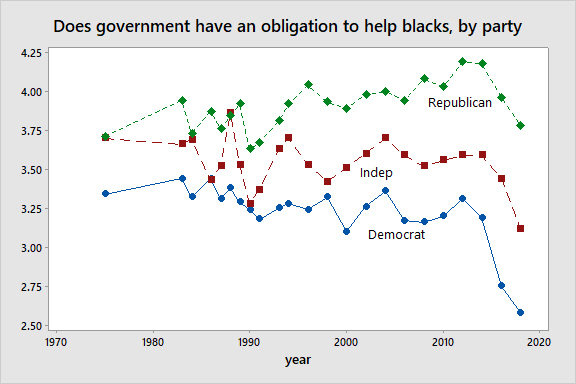 This is in contrast to a widespread view that party differences on civil rights were minimal until the 1960s. Their analysis led me to wonder if there were party differences in the general public as well. There weren't many questions on civil rights before the 1960s, but I found one from May 1952, which asked "Which of the following statements best describes what you'd like to see done about legislation to prohibit employers from turning people down solely because the their race or religion?" The options were "there should be a national law to protect minorities from discrimination in hiring," "it should be left to each state to pass such a law if it wants one," and "there shouldn't be any law like that; the problem should be worked out in some other way." This question deals with an important issue of principle and doesn't mention any party or political figure. As expected, blacks were overwhelmingly in favor of a national law (73%, 6% for leaving it to the states, 10% opposed, and 10% don't know). There were no clear party differences among Southern whites: 16% favored a national law, 33% said there should be no law, and 39% said it should be up to the states. But among Northern whites, there was a difference between supporters of the different parties: 39% of Democrats favored a national law and 28% said their should be no law; 26% of Republicans favored a national law and 40% said there should be no law. Since the question also mentioned religion, you might wonder if the party difference had to do with religion rather than race. Jews and Catholics were more likely to favor a national law than Protestants were (64% of Jews, 36% of Catholics, and 24% of Protestants), but the party difference is still there if you restrict it to Protestants. In summary, Northern Democrats were significantly more liberal than Northern Republicans on this issue, even at this early stage. The example seems to support Krugman's suggestion that "advocating economic inclusion seems to spill over into advocacy of racial and social inclusion, too"--that is, that the dominance of the overall liberal/conservative dimension is not an accident. 1 (blue): Would you approve or disapprove of an amendment to the Constitution [in 2013 "vote for or against a law"] which would do away with the electoral college and base the election of a President on the total vote cast throughout the nation? 2 (red): Presidents are now elected by the Electoral College, in which each state gets as many votes as it has members of Congress and can cast all of them for whoever wins in that state. Do you think we should keep the Electoral College, or should we amend the constitution and elect as President whoever gets the most votes in the whole country? 3. (green): Thinking for a moment about the way in which the president is elected in this country, which would you prefer--to amend the Constitution so the candidate who receives the most total votes nationwide wins the election or to keep the current system, in which the candidate who wins the most votes in the Electoral College wins the election? 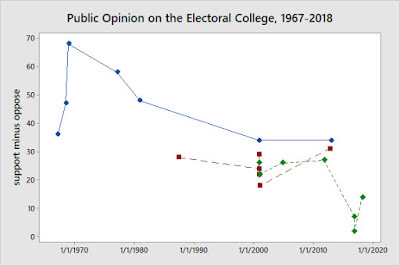 They are pretty consistent for the period of overlap, although support for abolishing the Electoral College seems a bit lower under the second and third forms (maybe because they explicitly say that it's the way we currently elect presidents). There is always more support for abolishing it than keeping it--until 2016, a lot more. It was almost even right after the 2016 election, but in the latest survey had returned to 55% in favor of abolishing it and 41% in favor of keeping it. The greatest support for abolishing it (80%) was in November 1968, right after the third-party candidacy of George Wallace, which had the goal of preventing an Electoral College majority. The election of 2000 had much less impact on opinions that 2016, maybe because of the general increase in partisanship since 2000. A lot of recent commentary has treated abolishing the Electoral College as a radical cause, but the public generally likes the idea. I thought that it would be fairly popular, but was surprised at just how popular it was, at least through 2013. I suspect that most people don't have strong opinions, and will just follow their party, so that if it becomes a significant topic of debate there will be something close to a 50/50 split. However, it seems unlikely that it will hurt the Democrats. 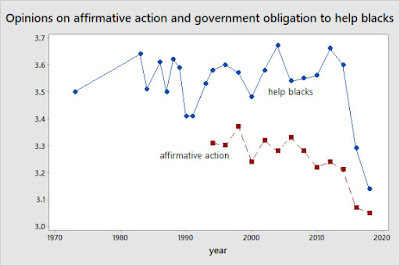 I haven't systematically looked at group differences, but what I've seen suggests that liberals and Democrats have always been more likely to favor abolition and more educated people are a bit less likely to favor abolition. I think there are two offsetting factors at work with education--more educated people tend to be less attached to tradition, but the popular vote is consistent with popular ideas of fairness. 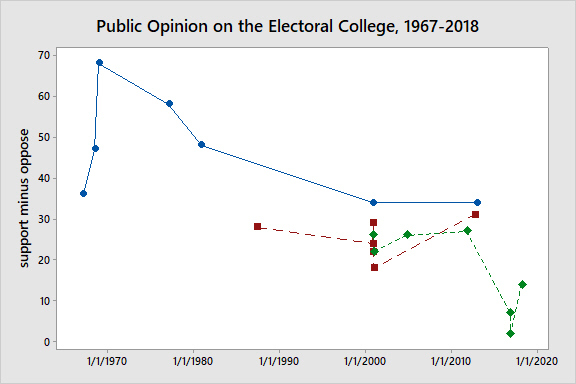 The arguments in favor of the electoral college are more sophisticated (not good, but sophisticated), so they are more likely to be known to educated people. It would be interesting to look at regional differences--are people in small states or "swing states" more likely to favor keeping the electoral college? PS: I criticized a column Jamelle Bouie in a recent post, but I should give him credit for the best commentary on the electoral college that I've seen.